Secure storage for small personal items. 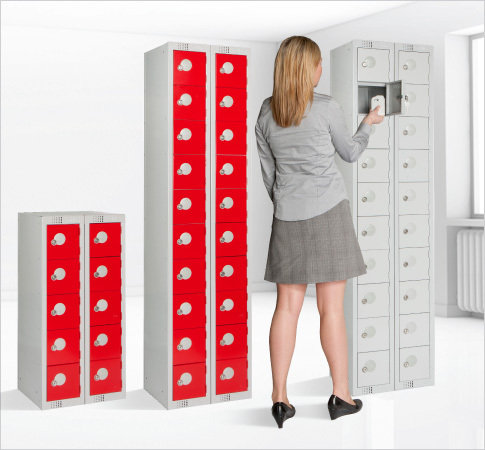 Secure storage lockers for mobile phones, wallets, purses, watches and jewellery. 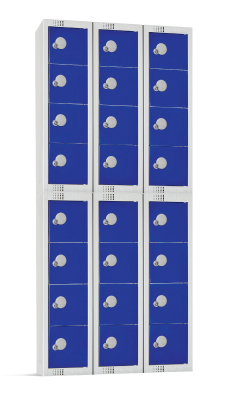 Cost effective high density storage solution for mobile phones and small personal items. Available in a choice of two heights..... standard height 1800mm high, 20no. compartment unit plus a 940mm high, 10no.compartment unit. Available with a 4000 mastered series cam lock. Can also be supplied with a keyless solution with the use of a padlock fitting. Compartment opening is 150h x 165w x 360d mm. Designed to be floor standing and can easily be nested or anchored to a wall for increased stability and security using the available nesting holes on the back and sides of each unit.